I have written before about bogus used clothes collectors. Recently I started noting the registration plate details to pass onto the Gardai so that they can check whether these people have valid collection permits. On Monday morning the sticker shown arrived in my door. 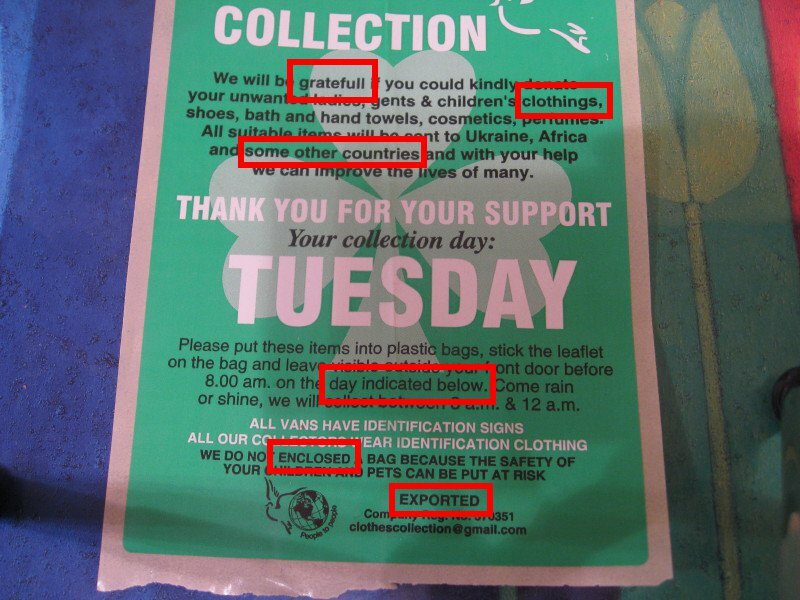 It has 3 obvious typos/errors and some other strange stuff too. A long time ago I emailed the email address given (clothescollection@gmail.com) but never got an answer. The first typo is “gratefull” which should be “grateful“. Then “clothings” should be “clothing“. At the end, “ENCLOSED” should be “ENCLOSE“. 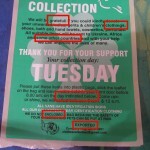 As for errors, “day indicated below” is wrong as the collection day is listed above that sentence.